Special Olympics volunteers and coaches are experienced working with young people and adults with autism. The goal is to find a sport that is best suited to each athlete, whether the athlete has sensory or socialization issues -- or just needs a confidence-booster. Autism Spectrum Disorder (ASD), or autism, is a complex neurological and developmental disorder that affects how a person acts, communicates, learns, and interacts with others. ASD affects the structure and function of the brain and nervous system. Because it affects a child's development, ASD is called a developmental disorder. ASD can last throughout a person's life. People with this disorder have problems with communication, interactions with other people (social skills), restricted interests and repetitive behaviors. Autistic disorder ("classic" autism). Autistic disorder is often what people think of when they think of autism. Asperger syndrome. Asperger syndrome is sometimes said to be a milder version of classic autism, mostly affecting social behaviors. Unlike people with autism, many people with Asperger syndrome have normal or above-average intelligence and language skills. Pervasive developmental disorder not otherwise specified (PDD-NOS, or "atypical" autism). PDD-NOS includes some, but not all, of the features of classic autism and/or Asperger syndrome. This category also includes childhood disintegrative disorder and Rett syndrome, two conditions in which a child develops normally for several months or years, then loses skills related to language, movement and coordination, and other cognitive functions. The symptoms of one person with autism can be very different from another's. One person with autism may have mild symptoms, while another may have more serious symptoms, but they both have ASD. Despite the range of possible symptoms, there are certain actions and behaviors that are common. In general, the main signs and symptoms of ASD relate to: communication; social behaviors; and routines or repetitive behaviors, sometimes called stereotyped behaviors. Doesn't point or wave "bye-bye"
Researchers don't know exactly how many people in the United States have ASD. The latest estimates suggest that about one out of every 68 children -- or 1.5% of children -- in the United States has autism. About 36,500 of every 4 million children born each year in the U.S. will have autism. ASD occurs in all racial, ethnic and socioeconomic groups. Studies in Europe, North America and Asia show an average prevalence of people with autism between 1% and 2% of the population. ASD is about 4.5 times more common among boys than among girls. For athletes with autism, the social experience at Special Olympics events can be both rewarding and empowering. Not only do our athletes learn new skills (and get to show them off), these athletes compete in a "safe" environment where they can interact with other people in a non-pressured, relaxing way. 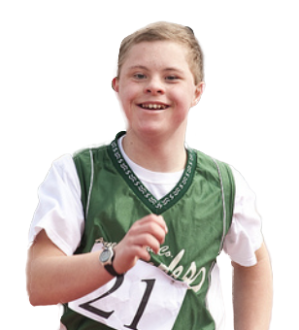 Special Olympics volunteers and coaches are experienced working with young people and adults who may have trouble communicating or who have sensory issues. We will find a way -- and a sport -- that is best suited to each athlete. For parents and care-givers, the ultimate reward sometimes comes in unexpected ways. One mom of an athlete with autism knew her son liked Special Olympics; he just wasn't able to tell her. Michael doesn't communicate well, so it can be hard to tell what he thinks. Then one day, the 15-year-old redecorated his room. His mom says, "We got a glimpse inside his mind when Michael decided to decorate." Apparently what Michael feels about Special Olympics ... is pride. He collected all his Special Olympics medals and hung them on his wall in a proud display. His mother says, "Now I am so proud. And happy! Sometimes it is so hard to make sure he can participate; it takes quite a lot of juggling to make the schedule work. This makes it all worthwhile." Sources: The Eunice Kennedy Shriver National Institute of Child Health and Human Development/National Institutes of Health, and the Centers for Disease Control and Prevention, and Special Olympics.